How many students get the chance to design their own playground? 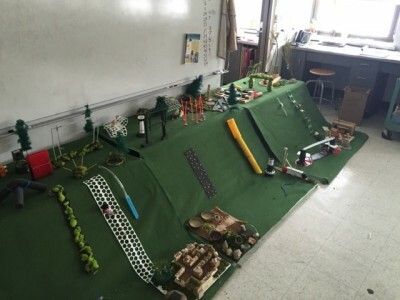 That’s exactly what’s happening at A2STEAM @ Northside, where students on Saturday will present a large-scale model of the playscape they’ve designed to a landscape architect. Principal Joan Fitzgibbon couldn’t be more thrilled with the student models. The school is now under heavy construction as new classrooms and a full size middle school gymnasium are being built. Part of that construction meant having to tear out the current playground. 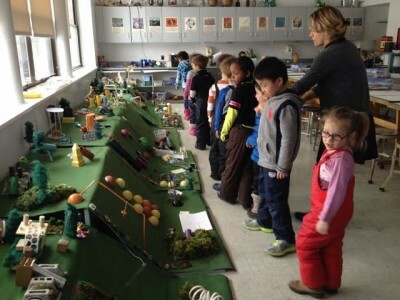 Students have drawn, painted and built model playscapes in this project-based learning project done in collaboration with MFA Candidate Laura Amtower from the University of Michigan’s Penny M. Stamps School of Art & Design. Students will be consulting with landscape architect Carey Baker, Beckett & Raeder Landscape Architecture Planning, Engineering & Environmental Services, and then propose final concepts to the playscape committee. Construction on the playscape will begin this summer.